No word yet on why he’s retiring (it will take effect at the end of July), or why he couldn’t hang on at least until after the midterms so the Democrats could have a realistic chance to block whichever neo-fascist Trump nominates (my money’s on that racist Manhattan lawyer who threatened to call ICE on the Fresh Kitchen workers). 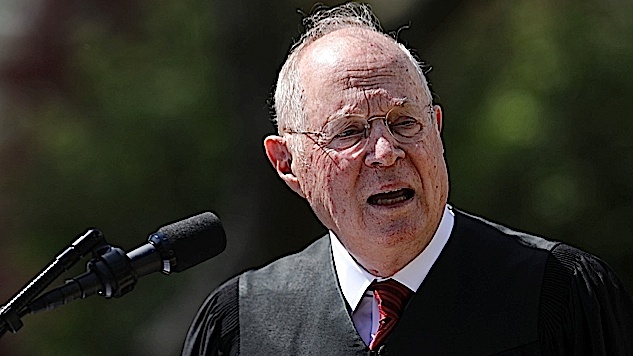 Kennedy is technically the “moderate” on the Supreme Court, but as he made abundantly clear yet again with the Janus and travel ban and gerrymandering and abortion crisis centers decisions, he’s only truly “moderate” by the batshit far-right standards of the current SCOTUS makeup. And he still sides with the right on most decisions that matter, from the ones listed above to Citizens United to Bush v. Gore. The not-totally-horrible news, then, is that this doesn’t materially change the godawful reality of most major cases being lost five to four. The extremely horrible news is that the key word in that last sentence is “most,” and that Kennedy has actually supported abortion rights and gay rights and rights for Guantanamo detainees in close decisions. So, maybe get ready to say goodbye to Roe v. Wade and a woman’s right to choose and god knows what else. He will undoubtedly be replaced by someone even more fanatical. The extra bad news is that Ruth Bader Ginsburg and Stephen Breyer are both very old, and it will be a small miracle if they stay on the bench through the end of Trump’s term in 2020. If they don’t, the result will be a right-wing Supreme Court stack that could hold up for decades. Looks like Jake Weindling’s proposal to counter-stack by adding new justices is, without irony, the best option for the next Democratic president. The nomination process will likely start soon, with Democrats unable to stop the next judge if the 50 Republicans not named John McCain present a unified front. Trump has a list of 25 potential nominees to work from.